While I'd sometimes like to think that I'm the first film/entertainment writer to attempt to bring Hollywood and its Eastern counterpart of Bollywood together, that, of course, is incredibly delusional on my part. Not only have there been people covering this territory before I took up the cause in late 2002, but there are those who have been doing so on a much more prominent scale. 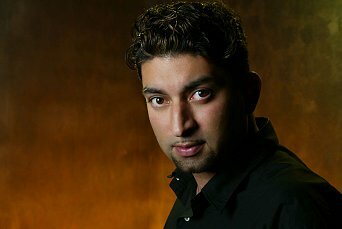 One such person is Sheeraz Hasan, creator and host of the weekly Hollywood-based, globally-seen weekly television magazine series Tinseltown. The 29-year-old Hasan's own story sounds like something that could have come straight out of a script from Hollywood or Bollywood. "[I] landed in LAX with only $4000 and a dream," says the native Londoner of Pakistani descent. And what an ambitious dream it was--after noticing a void in Hollywood coverage aimed at the international market, namely India and other South Asian territories, Hasan came to Los Angeles from London in January 2002 armed only with his vision and nothing in the way of filmmaking experience or--more crucially--contacts. The latter changed one morning in April 2002, when an emotional Hasan was spotted praying at, appropriately enough, the foot of the Hollywood sign by film producer Michael Levy. After a chat, a business meeting was set within the next ten days; within a month of that, the Levy-supported Hasan had secured a 52-week deal with B4U (Bollywood 4 U), a New York-based satellite provider of Indian/South Asian-targeted programming--all without a pilot presentation. The clincher? "I promised them celebrities, basically," Hasan says. With Levy's address book as a starting point and his own drive taking care of the rest, Hasan was on his way. Today, Tinseltown is seen by 500 million people worldwide, primarily in India, Iran, and other South Asian/Middle Eastern territories, but it is also broadcast in the United States, most prominently on Los Angeles's international-themed channel, KSCI/Channel 18. At first glance, Tinseltown may not look terribly distinguishable from the Entertainment Tonights, Access Hollywoods or their ilk. Each show invariably opens with a montage of Tom Hanks, Steven Spielberg, Will Smith, Catherine Zeta-Jones and numerous other A-listers (and the occasional B-lister) all done up to the nines, doing the familiar red carpet walk. But soon this E! network staple comes with a twist: all are shown giving personal shout-outs to Hasan, Tinseltown or both--thus setting the tone is set for the rest of the half hour. While the show serves up the familiar rundown of entertainment headlines as well as quick-cut footage from the outside red carpets and inside Hollywood parties, it all comes with Hasan's unmistakable stamp, whether from a general cultural viewpoint, as with the regular "Tinseltown Video Mix," which blends music videos from stateside acts and Bollywood films in one big masala mix; or a more intimately personal one, as in one recent episode commemorating his mother's birthday by featuring her favorite films and music, or his trademark queries to celebrities about their thoughts on spirituality. With Tinseltown now firmly connected to the entertainment worlds of both East and West, Hasan's next move is solidifying his and the show's connection to their audience. The show's website already averages in the neighborhood of four million monthly hits, but Hasan is taking the added step of opening up the actual show to his viewers and giving them a chance to voice their interests and concerns on air. "I want to turn Tinseltown [into a show] not only about entertainment but more importantly about the community because the community needs a microphone, and Tinseltown is [a] microphone amongst all ethnicities," Hasan says. "At the end of the day, we need to have a voice. We need to make a difference in many things domestically and worldwide. We want everybody to participate in our show." It's a wildly ambitious, perhaps idealistic, idea, but given Hasan's track record so far, it would be a mistake to say that this latest goal is outside of his reach.